OneGiantRide: Day 3: Ntsikeni to Masakala. 87km/9 hours. Much better day today, felt good and was able to ride a lot more than previous days. Great hosts at Ntsikeni, Jim, Gloria and Dula the story teller - they really helped me to recharge after yesterday! Got away a bit late at 8:15 and started with an 8km walk out of Ntsikeni thanks to long grass and deeply rutted paths, pretty cold too with temps around minus 2 and lots of frozen puddles. 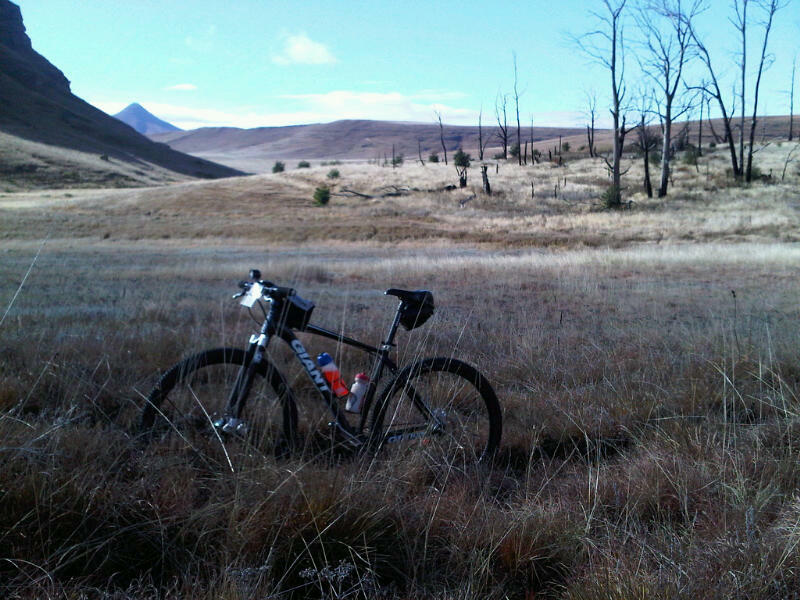 Once on the roads, I found some nice rythym on the bike and skipped coffee at Glen Edward farm, aiming for Masakala (near Matatiele) before dark. Some good technical singletrack on the way, although I really missed having front shocks on the rough stuff, my arms took a pounding! Coming into Masakala, I had a few issues with the chain jumping off repeatedly, so tightened up the tensioner but didn't really help... Chain was very dirty though, with sticky gunk, so I took it off and cleaned it properly and re-lubed everything too. Hope this isn't an issue again tomorrow. Got to Masakala just after 5pm and found Rob here - he's waiting for a lift back home after pulling out of Ride2Rhodes. Passed through a mix of tribal and farming areas today with many farmers burning firebreaks now, quite weird riding past the heat of the veld burning while you're looking up at the snow covered peaks of the Drakensberg ahead... Just waiting for washing to dry and then bed. Glad you are feeling better :-) Have fun out there! >>Chain was very dirty though, with sticky gunk, so I took it off and cleaned it properly and re-lubed everything too.